Rugby football is one of the most popular versions of football in the English schools. Nowadays it has a great amount of fans all over the world. We decided to create a special listing where you can easily find all our premium rugby flyers templates related to the rugby football. 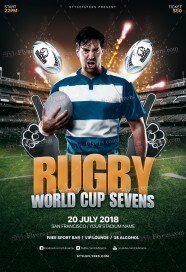 Here you can buy rugby flyer PSD templates, which will help you to advertise online your rugby events. Styleflyers company tries to combine all advantages for its clients, including, affordable price, high quality, unique design, easy customization, free Facebook cover and the opportunity to order your own exclusive rugby Photoshop files. 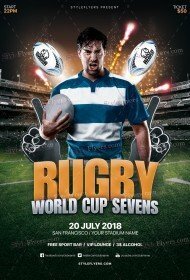 If you want to get a high-quality product to promote your sport event related to rugby football you will find the best advertisement, which is available for sale here. Watch our updates and you will buy rugby flyer template first. If you aren’t satisfied with any part or detail you can customize it and bring your template to the perfection, or you can hire us and we will do all changes for you. Our designers will do their work quickly and professionally. Rely on our professional assistance and get the outstanding results. You sport event won’t leave anybody unfazed. We will care about that. Buy printable sample right now.